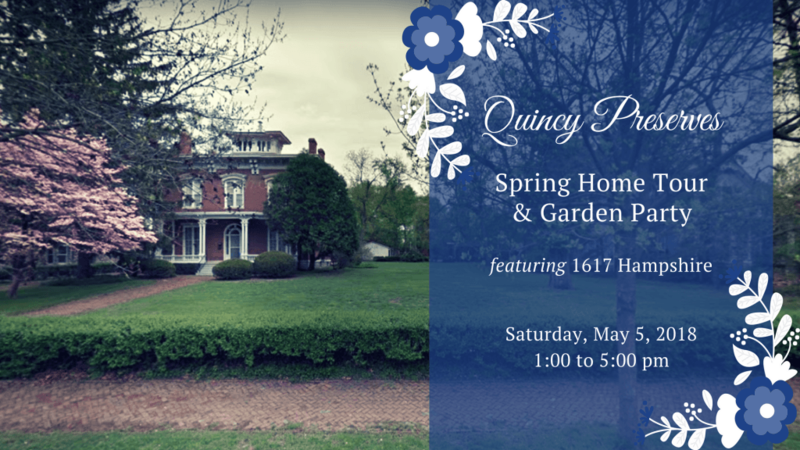 Quincy Preserves cordially invites you to our 2018 spring home tour and garden tour. This year’s spring home tour takes place on Saturday, May 5th, from 1-5 p.m. and will be a little different from years past. The tour features just one impressive home and garden at 1617 Hampshire Street. Tour guides will share historical information and point out architectural details about the home. Decorative pots from various nurseries and florists will be on display and available for sale following the tour. After touring the home, guests are invited to enjoy a backyard garden party featuring entertainment, light hors-d’oeuvres, refreshments, and a cash bar. Tickets may be purchased in advance for $12 online or at one of the following locations. Tickets are available on the day of the tour for $15. Proceeds from the tour provide funding for Quincy Preserves philanthropic activities including scholarships, internships, and its Façade renovation fund for Commercial, Residential, and Non-Profit organizations for historic structures in Quincy.